The soundtrack of the Hong Kong blockbuster Infernal Affairs I-III. movies were all written by Chan Kwong-Wing (aka Comfort Chan), and they have been released separately in 2002-2003 (some of them are OOP) and later as a “Trilogy” 3 CD pack, which can be purchased here. – Young And Dangerous V.
Unfortunately not all of them are released, e.g. the two Donnie Yen movie (SPL and Flash Point) had great tunes but are still not on CD. According to imdb he’s now working on a movie called Magazine Gap Road. 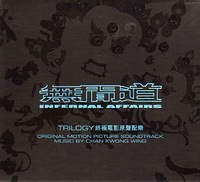 All movies of the Infernal Affairs trilogy were nominated for best originals film score award, but only the second won a prize for the best song which was played by Beyond, a Hong Kong rock band. The movie itself is one of my favourites and had an over the top cast, great picture and directing, clever story and an amazing soundtrack, so its final perfection is made of many important details. Still I think the music part has great importance in it because what made the film so unique at its time was mainly the style and the mood it had. Chan’s soundtrack is not only a proper accompaniment but also a great music album that can stand on its own. It’s enjoyable without the movies, even many years after watching the scenes. What I like the most is how atmospheric it is and how clever. There are countless different elements, styles, sounds mixed into one poweful, original piece of music. It’s all in great harmony and still provides a lot of surprises, new tones and rhythms to keep it interesting till the end. The sound is rich, especially the acoustic instruments make it very nice. Classical music, symphonic orchestras and choirs add the drama element, modern rock riffs, drums, electronic sounds make it cool, and we get some Chinese flavour on the top. There are some sad melodies perfectly fitting to the movie, the whole music is very passionate, original and still full of catchy tunes. My favourites are the first two albums. The Infernal Affairs I. soundtrack has a little commercial feel just like to movie but it would be my fav if I hadn’t listened to it waay too much. The second one is a bit more special for me, because it has Hungarian lyrics in 3 songs. It’s also more dramatic. I’d give 10 out of 10 points to them, and maybe 7 to the third one which I found less interesting.